Verdy Jake is a well-known silversmith who makes mostly bracelets and rings. 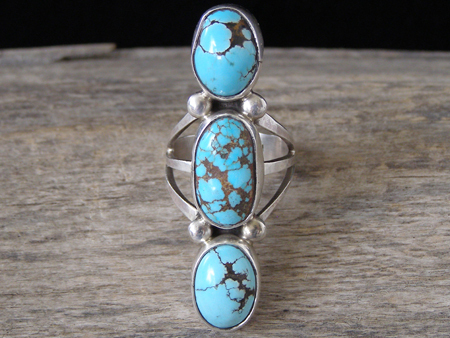 This is a classic three-stone style of stacked stones making a slim, long design of beautiful blue natural, untreated turquoise set in smooth bezels. Hallmarked V and stamped Sterling inside the shank. Stones: middle 11/16" x 3/8"; top & bottom 9/16" x 3/8"
Length of stone sets: 2"